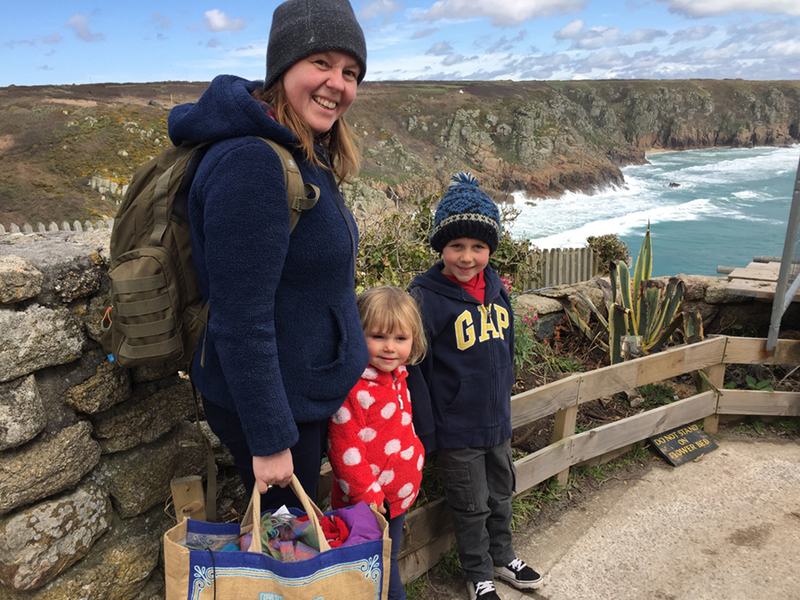 The Minack Theatre is Cornwall’s world famous open-air theatre, carved into the granite cliff and set in glorious gardens overlooking the spectacular panorama of Porthcurno Bay. 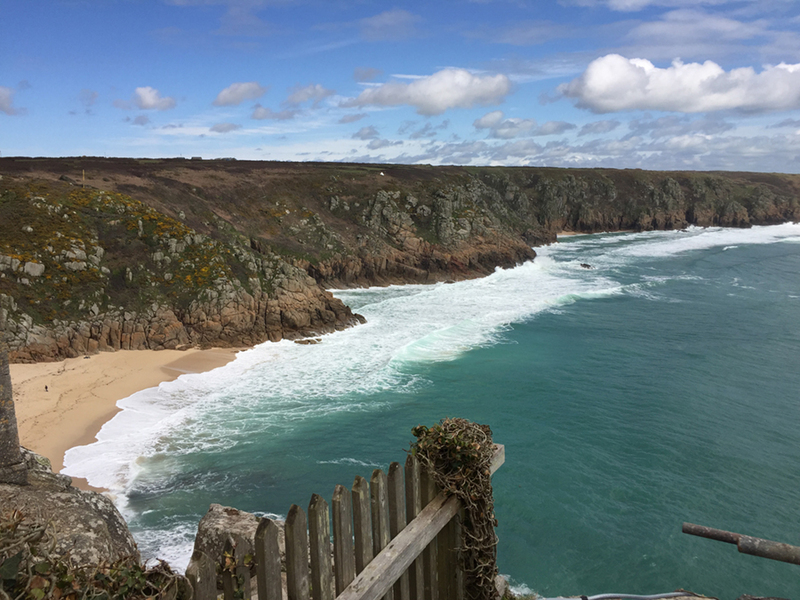 No matter when I visit this magical place, catching a glimpse of the pounding waves and turquoise sea crashing against the granite cliffs always takes my breath away and makes me realise just how lucky I am to live at Bosinver, in this beautiful county of Cornwall. 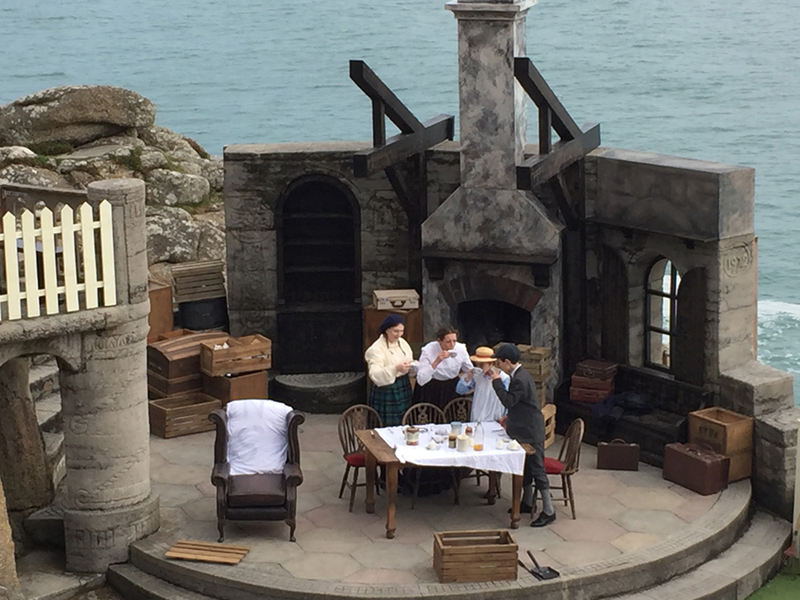 Rowena Cade and her gardener Billy Rawlings set about building a stage and terraced seating in the cliffs below her house in the 1930’s as a performance space for the local drama group who needed somewhere to stage Shakespeare’s play ‘The Tempest’. At the entrance is the Visitor Centre where you can find out how this remarkable woman built this Internationally famous theatre with her bare hands. 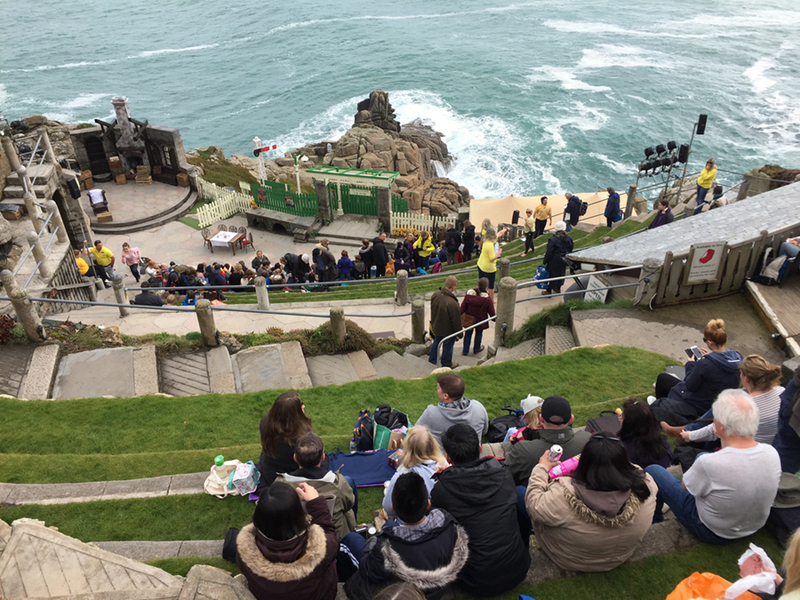 .The Summer season runs from April until October and a full programme of events can be found on their website www.minack.com If there are no performances it is possible to explore the theatre and the sub- tropical gardens with their exotic plants. I decided to take my grandchildren to see ‘The Railway Children’ as it is a family favourite and I knew two of the cast, Kyla Goodey and Craig Johnson from their involvement with Kneehigh theatre and they always give excellent performances. After sitting through a deluge last time I went I had my fingers crossed for fine weather and the weather Gods were listening. A dull, drizzly morning soon cleared as we headed west and by midday the sun was shining. We took a picnic lunch and arrived early to get a good seat on the Lower Terraces. The view was spectacular out to sea but I was also impressed with the simple set which combined Three Chimneys Cottage with the Railway station. 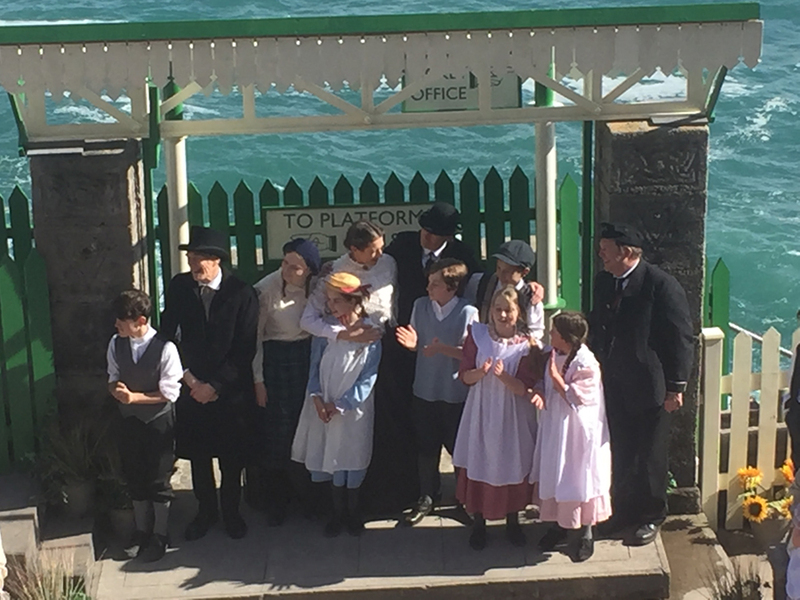 There was a large number of local children in the cast and they were all really good. Craig, as Perks the Station master was the outstanding actor of the day, combining his part with that of humorous narrator. I was particularly impressed by the use of sounds and smoke to convey arrival and departures of trains, quite believable! 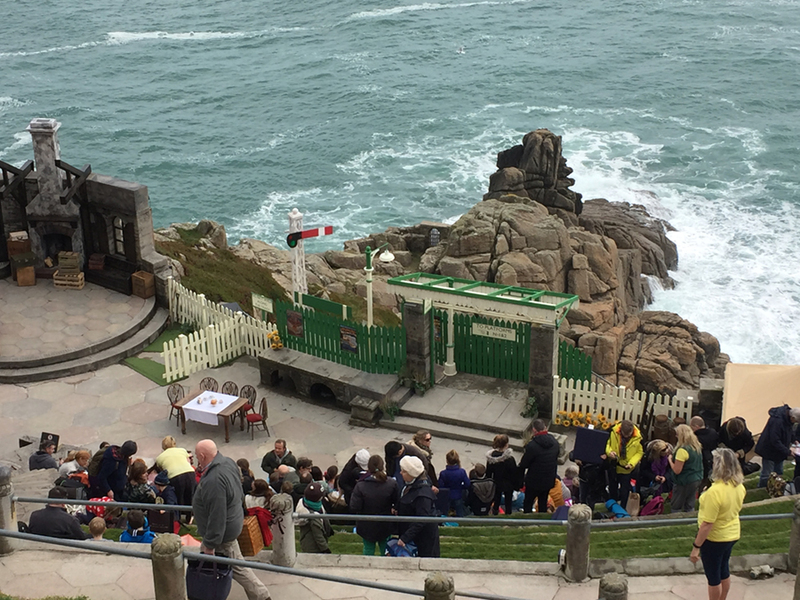 Sam and a Jasmine aged 4 and 6 loved it and I hope that they will come to love the Minack and outdoor theatre in general as I do. It fosters the use of imagination and a special engagement between cast and audience that you never get from a film or game machine. Luckily we have many opportunities to experience live theatre here in Cornwall, another reason for me to love where I live! If you would like to know more about booking a family holiday here at Bosinver, please email reception@bosinver.co.uk or call 01726 72128.